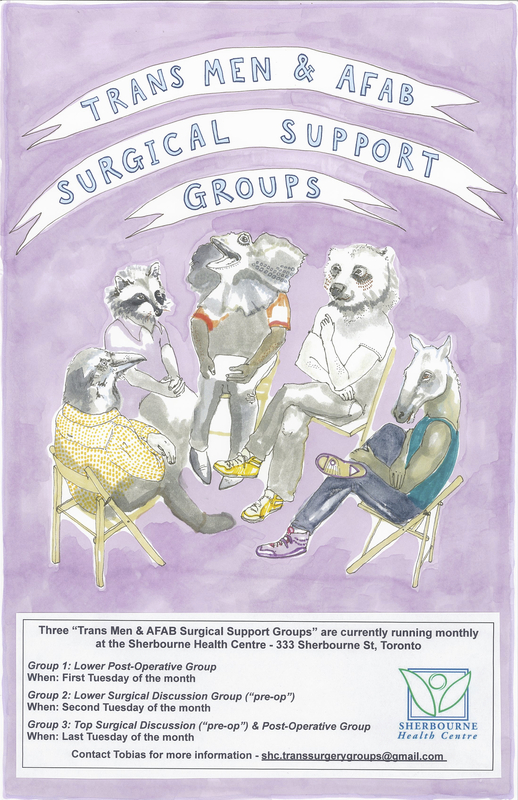 Three peer-to-peer groups at the Sherbourne Health Centre. These monthly sessions provide surgical support (pre-bottom, post-bottom & top) for trans men and AFAB* identified people. If you are interested in joining any of the groups, please contact me at shc.transsurgerygroups@gmail.com for more information. Also feel free to visit the FTM and AFAB Surgery Resource List (Toronto and GTA) – updated regularly through the group’s discussion and needs. This group is open to trans men and AFAB people who have undergone lower transition-related surgery. Through peer-to-peer support, the meetings aim to help trans men successfully navigate their surgery(ies), healing processes, and transition options. By sharing their lived experiences, members will access resources, provide emotional support, and meet people with whom they can identify. The group will also host guest speakers on a variety of issues, dependent upon the participants’ interests and needs. Pre-registration is required. This group is open to trans men and AFAB people who are considering bottom surgery, or are soon to undergo bottom surgery. Through peer-to-peer support, the meetings aim to provide information about surgery options, surgical processes, navigating Ontario health care systems, trans resources, mental health, and sexuality. The discussion aims to help participants create a lasting support network of trans people from a range of social locations and experiences. The group will also host guest speakers on a variety of issues, dependent upon the participants’ interests and needs. Pre-registration is not required.